PRESENT YOURSELF A GLORIOUS CHURCH, by Ray Watson - mp3 song lyrics chords. A song written for communion. A song written to accompany a Sunday morning communion service. Tired of guilt? I wrote this song to help alleviate some of the sin-consciousness that seems to plague certain sectors of the Body of Christ today. You may be blessed not to have this problem, but many believers I have encountered in life seem to suffer from a severe hangover of guilt. This song reminds us that it is all about grace and the perfect sacrifice of Jesus Christ. 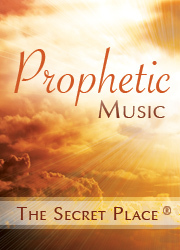 Discover The Secret Place - intimate songs of the heart. With an emphasis on intimacy and simplicity, these songs are sure to capture your heart, and leave you with an enduring sense of His presence, and a hunger for more. Tired of guilt? I wrote this communion song to help alleviate some of the sin-consciousness that seems to plague certain sectors of the Body of Christ today. You may be blessed not to have this problem, but many believers I have encountered in life seem to suffer from a severe hangover of guilt. I don’t have to be perfect to come into His presence, because my performance is not the criteria that gets me behind the curtain. It was His performance that ripped the curtain, not mine. Having begun in the Spirit, am I now about to be perfected by the flesh? I come just as I am, because it’s not about my perfection, it’s about His. In the Old Testament when a sinner came to worship he brought an animal without blemish to be examined by the priest. The priest did not examine the sinner, he examined the sacrificial animal. If the sacrifice was without blemish, both the offering and the sinner were accepted. In the New Testament God does not examine us, He has already examined Jesus and found Him to be a perfect substitute for our examination. That is why we are “accepted in the Beloved!” For more about this read the following article - Passover Lamb. The devil used to tell me I had no right to worship, because I wasn’t a good enough Christian. These days I worship whether I feel worthy or not, because now I realise it was never about my worthiness in the first place. It’s all about His worthiness. My worship is acceptable to God, because it only points to Him, not me! I feel there has been some misunderstanding regarding the role of the believer in preparing for the coming of the Bridegroom, and it is yet another guilt trip we all have to deal with. “Without blemish” actually means to be faultless and unblameable. Who is going to attain to that? The only way this is going to happen is to be credited with the faultless record of God’s own Son. And does it not say that Jesus is the one who is going to present to Himself the glorious church? We are not the ones presenting ourselves, it is His finished work. What exactly is the righteousness of the saints? Is it not the finished work of the cross? Isaiah describes our own efforts (outside of abiding in Christ) as filthy rags. We put off our own rags of unrighteousness when we get saved, and to us it is granted to be arrayed in fine pure linen – the robe of His righteousness. We are ready. We are made ready the day we are born again and change our wardrobe. He makes us perfect in His sight - “without spot or wrinkle” - wearing the robe of His righteousness. I once argued with the Lord that it was all very well being “imputed with His righteousness” but that I still had to deal with the knowledge of my own failings. He told me that I would feel a whole lot better about myself if I realised that He sees me with the record of Christ’s performance and not my own. What a revelation! If we could only grasp the truth of our doctrine in a way that made it tangibly real for us, we would be much happier Christians! He truly is Jehovah Jireh our provider. Abraham told his son Isaac, “God will provide for Himself the Lamb for the sacrifice.” God Himself has provided our righteousness, and it is perfect righteousness, without spot or wrinkle. Thank God for our wedding attire! The Bride has made herself ready! Who gives this Bride in marriage? He does! Present yourself a glorious church Lord! Sign up for 5 FREE songs now! PLUS a FREE song every month! More Info. 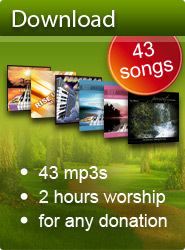 Play songs from The Secret Place on your site with our free mp3 players.